Northern Ireland Secretary of State Karen Bradley does not have a “deep appreciation” of Irish politics, the leader of Sinn Fein has claimed. Mary Lou McDonald made the comments as she accused the cabinet minister of making “erroneous and dangerous” comments about voting rights in a potential border poll. 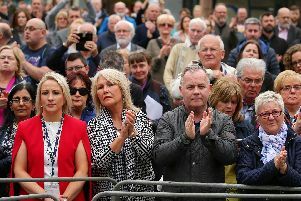 Ms Bradley sparked controversy when she appeared to suggest that Irish citizens living in the UK could not vote in such a referendum, but the government later moved to clarify her remarks. Asked if Ms Bradley should resign, Mrs McDonald said that her resignation “wouldn’t solve the problem”. Last month Labour MP Conor McGinn asked Mrs Bradley why the reciprocal voting rights for Irish citizens do not cover referenda. In her reply, Ms Bradley said: “The voting rights which will continue to be enjoyed by British and Irish citizens are reciprocal. The government later said voter eligibility rules for referenda were determined on a poll by poll basis. Irish citizens were able to vote in the 2016 EU referendum. Michelle O’Neill yesterday met Mrs Bradley in Westminster while Mrs McDonald met Labour leader Jeremy Corbyn. Mrs McDonald warned that a customs union does not “solve the problem for the north of Ireland”. She said a customs union “probably makes sense for Britain” but “you need to be aware that membership of the customs union alone does not solve the problem for the north of Ireland – we need alignment also with the single market”.